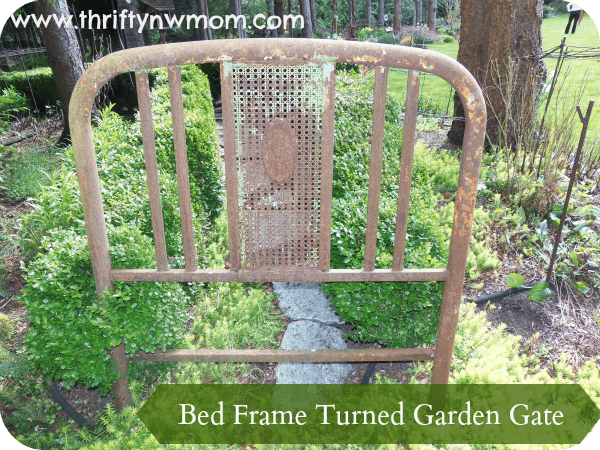 DIY Garden Gate – ReUse A Twin Bed Frame! Here is a fun idea if you have a garden area you are looking to spruce up. The garden bed above is my mom’s and she had a little walk set up that the kids love to take walks through. 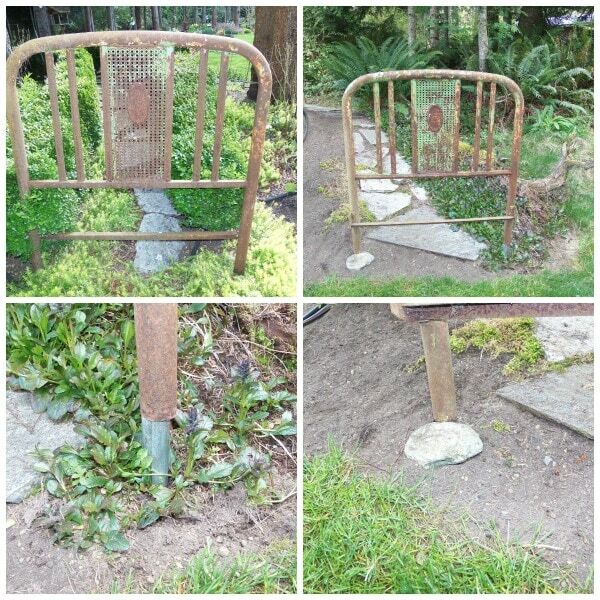 My mom found this rusted bed frame at a second hand store, and turned it into a front and back gate for this garden. We like patina (ahem – rust), but you could use a cute white wood one for more of a white picket fence look, or paint it (just be sure to weather proof it). You can search garage sales, thrift stores, antique shops and more. You will want a twin size bed, and just need a headboard and footboard to create your own custom gate. The picture above is of the front entrance and back entrance of the gate. 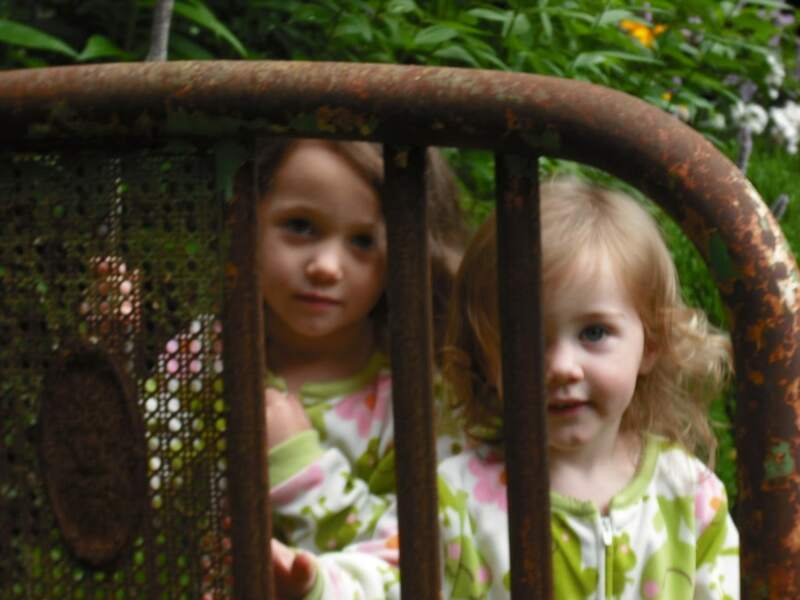 It’s not a long walk, but the garden gate makes it so much more fun for the kids (and us adults too). My moms gardens are in a local garden show, and one of the organizers of that said that its very important to always have an entrance and an exit to a garden when possible. It gives people a visual path to follow, and provides closure on the experience of enjoying a garden when they exit. It does not have to be a gate, but what a fun way to follow that rule. That may be too technical for your back yard – but I think its true. 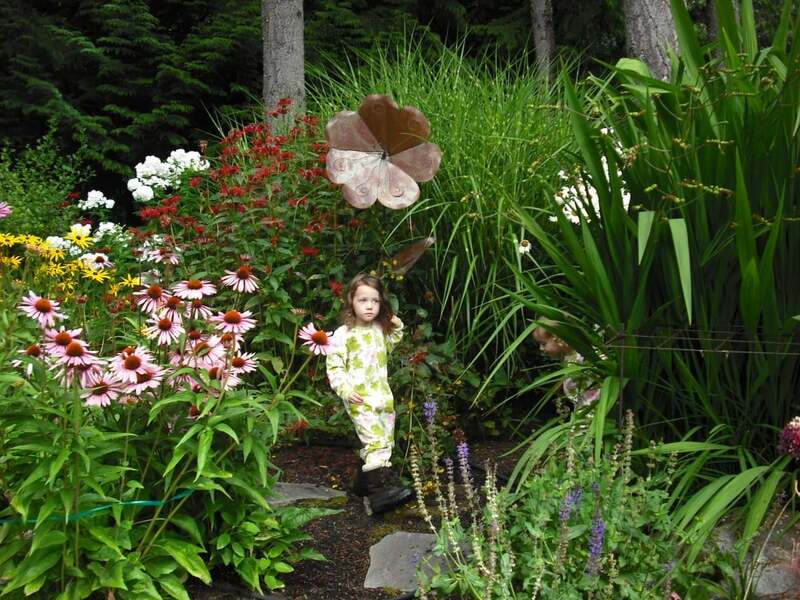 This garden has less color then the rest in my moms yard, yet the kids gravitate to it each time. First, track down a piece of pipe thats a bit smaller then the diameter of the outer posts on the bed frame (so that the bed frame will slide over the pipe (bottom left picture above). Also make sure that the pipe is long enough to pound around 3-4 inches into the ground, and still have about 4 inches left to attach the bed frame on. Pound the pipe into the ground where you want the stationary side of your gate to sit. Put one side of the bed frame over it. Now find a cool rock to act as a stop for the other side of the gate. That is the side that you open and close. You just have to place it back behind your rock when closing. Well, it will only work for a bed frame that has hollow sides, but you could use the same idea with other frames, only you will have to come up with another way to attach it to the pipe that you have pounded into the ground (maybe drill it in)? And here is proof that the kids love it!